If you are familiar with the artists, the titles don't need explanations. The same can be said for the title of my Poor Old Lu list, but I'll elaborate. It is of coursed based upon the Lu song "What if Uncle Ben Had Lived?" which of course is a Spiderman reference. The song didn't make my top 25 from the band, but that theme is a frequent one for me: "What if ______ (fill-in-the blank with a band) had made more music?" 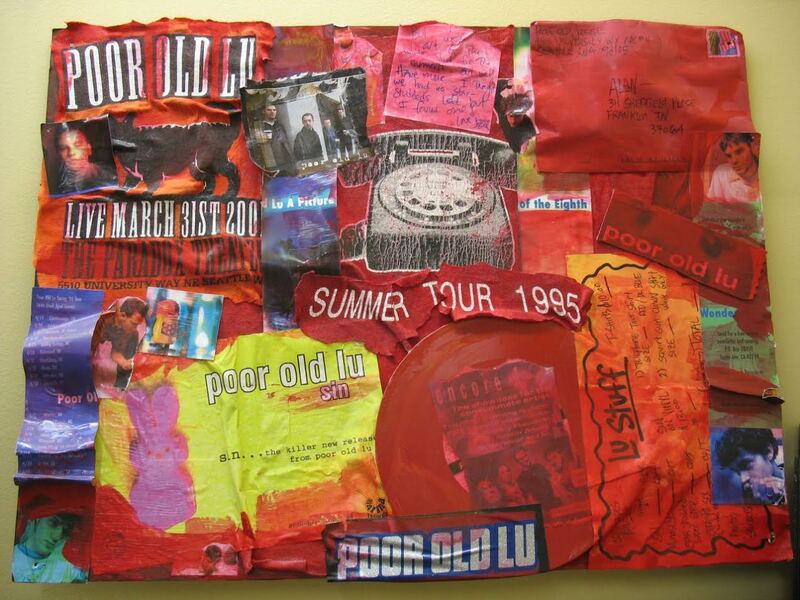 So, what if Poor Old Lu had continued as a prolific band for the last 20 years? the band's mid-90's mail order form, and two stickers. Pretty fascinating to think about it, because most bands are not able to do that. The only collaborative bands that are truly able to continue indefinitely are ones that make a lot of money. Of course in this day and age "solo" artists can record and release as much as they want to, but they only will if they are able to find the time to do it. Most of my favorite bands were only truly "active" for a short time, because...life. People move, get married, change jobs, etc. I rarely see or talk to many of my friends from 20 years ago. So it is pretty rare for a band to continue to make music after that has happened. Poor Old Lu's final LP was in 2002, and their 2013 and 2014 singles were treats that I'll hope for more of in the years to come. Jesse Sprinkle was recently interviewed on the Labeled Podcast about Poor Old Lu's break-up, and not surprisingly, he had nothing interesting to add. 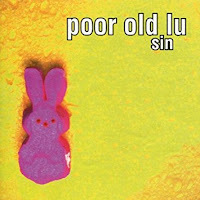 Poor Old Lu was only truly active for around a decade, and I am thankful that they were because I have never heard another band like them. I hate comparisons in general in music (RIYL, etc. ), but with Poor Old Lu comparisons are impossible. They formed in Seattle during the grunge era, but they are far from grunge. Friends and collaborators indirectly started emo, but they are definitely not emo. 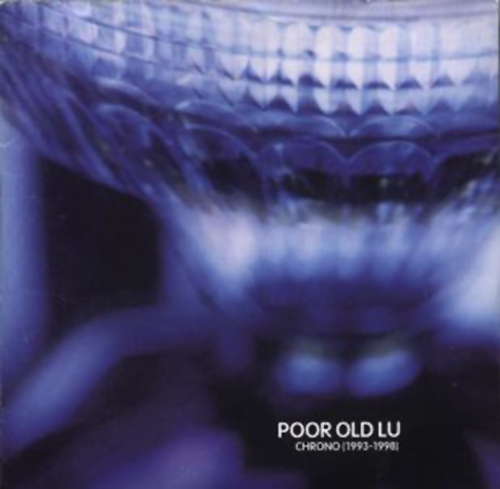 Poor Old Lu is completely original and experimental rock band that stunned me at the time, and are blowing me away right this minute as I listen to songs I have heard hundreds of times. I have so much respect for Poor Old Lu and (the very few) bands like them that are only willing to exist and perform as the original line-up; in this case Scott Hunter, Aaron Sprinkle, Nick Barber, and Jesse Sprinkle. I have written at length about how important I feel collaboration is and how I believe it leads to the best in all fields. All four members are gifted and have done so much outside Poor Old Lu. Scott sings and plays guitar, and went on to front the short-lived This Diminishing West. Nick wrote and sang lead on a couple of Rose Blossom Punch Songs, and has also played bass for Jeremy Enigk, Fair, Subways on the Sun, and numerous other bands. Jesse played drums in Demon Hunter, Dead Poetic, Morella's Forest, dozens of other bands, and also has released countless solo albums in which he sings and plays most all the instruments. And then I break down all of Aaron's projects here. All the comments below that are in italics are from Poor Old Lu lead singer/lyricist and are quoted with permission from the official Poor Old Lu website. Two of the songs--"Drenched Decent" and "The Great Unwound"-- didn't have liner notes, so I reached out to Scott Hunter to write them for this post. So they are published here for the first time. "The last song on '8th Wonder', it was intended to be such -- a last song. Was it intended to be the "final" track for Poor Old Lu? Who knows. It was, however, a good way to end the album. If I had my way, I would make the final build at the end of the song even more dramatic." 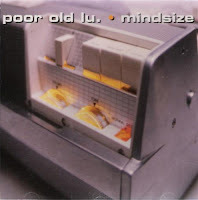 The A-Zone radio show in Nashville introduced me to Poor Old Lu, and "Ring True" and "Bliss Is" were the two songs I heard first; radically different and convinced me to go out an buy Sin immediately, and then Mindsize a week later. "'Ring True' is probably the most "intentionally" worshipful song that Lu has. Written just before recording 'Sin' (and finished up in the studio), it is probably most notable for its raw sounds, catchy groove, and the fact that Aaron sings lead vocal. 'Ring True' happened to be one of the most successful singles that Lu ever released and was always a fun song for live shows. Though 'Ring True' features Aaron on lead vocals, the lyrics were still written by Scott (who wrote all of the Poor Old Lu lyrics *except* 'Army Guy', which was written by Nick and Aaron). Shortly before laying down the vocal tracks, Aaron was facing some writer's block and asked Scott to the lyrics, if possible. 45 minutes later, or so, 'Ring True' was ready to sing." 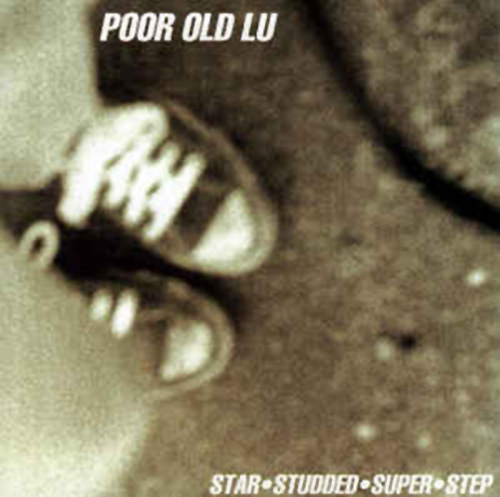 "Of all the Poor Old Lu songs to show up on Napster in great number, this one did. I always found that strange until I heard that there was also a band called Slipknot. I can only imagine all those people who downloaded this song thinking it was the other band! Very amusing. As the brief text in the album cover eludes, this song is directed primarily towards the topic of 'indifference'." "'Crowded' was born musically from something that Nick created, and it's one of my favorites on this album. Although fairly mellow and "acoustic", I think it fits well. For some reason, when I listen to this song, though, it sounds to me as if I had a cold during the vocal tracking. Hmmm. Strange. Also, Nick helped me write the bridge vocal line on this song. Thanks, Nick! You'll notice a very strong sense of "being pulled" in the words of this song -- whether it be our eyes, our devotion, our priorities, or what have you. The title, 'Crowded', is chosen accordingly, and there is a claustrophobic feeling in our lives at times, as we can feel overwhelmed by all that is going on." Most Lu fans probably have this song in their top 5, but I personally feel like Lu songs should be at a higher bpm. Great lyrics, and better live than on record, but never grabbed me as much as other people. "'Sickly' was written entirely in the studio over the course of a few hours. The guys (Aaron, Nick and Jesse) began to jam on a moody song in the main room while I (Scott) tried to work out a suitable melody and lyrics. Without much warning 'Sickly' was born. Very moody. Slightly aggressive. Quiet and loud. 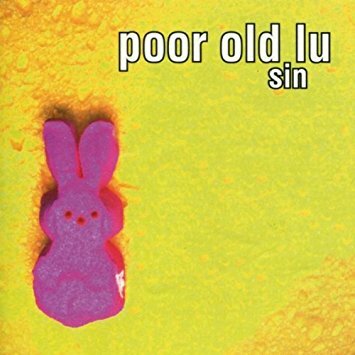 'Sickly' remains one of my very favorite Lu songs - partly because I think it's a good song, and partly because of how mysteriously it came to be. Coupled with 'My World Falls Down' on the tail end, 'Sickly' has also been a favorite concert song. An equally moody video for 'Sickly' can be found on Poor Old Lu's 1995 video cassette, 'Sit & Stare'." "This song is probably most notable (to me) for being very much *below* my normal singing range. The out-of-range vocals reminds me, I suppose, of 'Untitled' off of The Cure's 1989 release Disintegration, an incredible album. It works, I suppose, and that's what matters. I've never been accused of writing a whole lot of love songs, and rightfully so. 'Sunny Weather', I suppose, is as close as I've gotten thus far. This song was actually written for my wife, but I never told her ... she figured it out later on." I couldn't disagree with Scott more about this being a filler track! Love the bass groove and Aaron's bgv's on the chorus. "This song is probably one of the 'filler' tracks on 'Sin'. It wasn't a single. It wasn't much of a concert hit. In fact, this song was rarely mentioned at all. Why is that? Who knows. Maybe it's just not that good. It was one of the rare mellow tracks on 'Sin'. Slightly dreamy and somewhat playful. Aaron came up with some good background vocals, and Nick's bass line quite nice. I suppose 'Slow' just helped round out the album. We'll leave it at that. This song is very much written with 'emotions' in mind - literally. Some lines refer to colors. Some lines refer to common feelings that we have." "I don't remember where 'Revolve' ended up in the writing process. Probably somewhere in the middle. I just remember this song "appearing" one day during our sessions, and that was that. A natural opener for the album, if you ask me, and somewhat quintessential "Lu". Otherwise, it's very much a "power pop" track, with a radio-friendly 3:45-ish time to match!" "I don't remember where this song came from... it was just 'there'. Though a number of the songs off of 'Sin' were written in the few weeks before recording started, this song was among those that were veterans by that time, and, in fact, we even recorded a rough demo for 'Complain'. One of the notable items in this song is the two different lead vocal track sounds - one normal (and full sounding), while the other is very "mono" and slightly distorted. This wasn't only fun to do, but also created a "ask a question" and "give an answer" vibe to the various verses. On the last verse, of course, the tracks are switched so that the answering track is then "asking the questions", so to speak. There's something deep there, I imagine...somewhere. I still feel that this was the best song to start the album with. It's rough, strange, and hard to put your finger on... like much of 'Sin'." 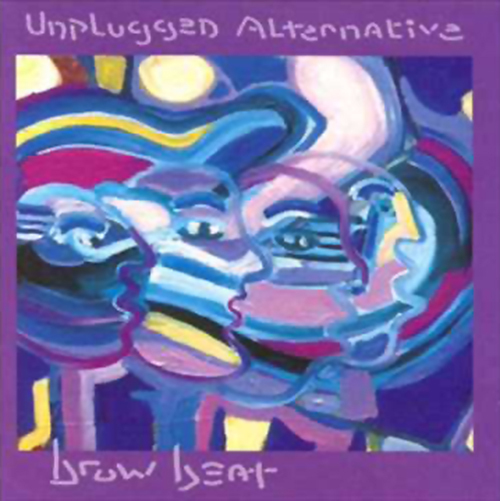 One of those songs that never landed on a true Poor Old Lu album, "Drenched Decent" was solicited by our record label for an "unplugged album" that they wanted to release. That was about all we knew. We wrote and recorded this song ourselves, and left all electric instruments at home--save for the bass. The masterful flute was written and performed by a long-time band friend, and may be the most striking piece of the track. The result was surprisingly upbeat and different from our norm--leaning toward whimsical, and light. When it was later released on the "Brow Beat" compilation, it stood out with it's very stripped-down and playful sound. The title "Drenched Decent" actually existed before the song--from a short list of names that we considered before finally landing on Poor Old Lu. The lyrics, however, are a calling--plain and simple. A calling to take hold of the relief, grace, love, strength, and peace that is right in front of us. "Now leave your cup and won't you come on in" is a challenge beyond simply tasting for immediate effect, but rather finding yourself awash in the filling of God. Lyrically, I'm surprised that this song didn't receive more criticism. It is fairly brash and in-your-face, but also quite true - at least for the time. What's it all about? I'm glad you asked. "Bliss" was written about family. My family, to be exact. I grew up in a good household with loving parents, two older brothers, so on and so forth. We all got along quite well, actually, but after moving out of the house I realized that we had some serious communication problems. In essence, not communicating when needed ("on the floor, out the door, clean the slate")." "Certainly one of the most haunting, melodic songs that we ever wrote. I was personally completely taken by it the very first time that I heard the music, and I couldn't wait to write lyrics. The title comes from the song 'Honeydrip' off of Ian McCulloch's solo album "Mysterio". 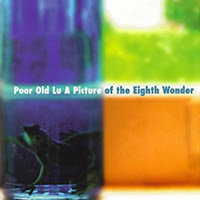 Like much of our "8th Wonder" album, this song was written entirely in the studio during our 2-week tracking session." "We had recorded this song once before at Innovations Music & Media, where Straight Six was recorded. It was rough, but pop-y. At the time, this was probably our most exciting song and, in fact, quickly became a crowd favorite. Eventually, we would have friends 3NP join us on stage for a hip-hop style interlude in the middle. The album version features sound-bites taken from Swirling Eddie's video "Spittle & Phlegm", at our request. With notions of televangelism sprinkled throughout the lyrics, this song hits on the dangers of self-serving ministries, focused more on money than on the Lord, and its effects on those who believe in it. The other message refers to television itself. The idea being that much of what people do is based (wrongly) upon what they see from television." One of my favorite Easter songs, and the song is unashamedly about Jesus' resurrection. "Another song that I wished had begun less abruptly, but we were running out of time while tracking this album. That said, I really love the "delayed" electric guitar lines during the second verses. Also, the "bongo"-styled drum parts during the bridge was masterminded by Aaron, and works out pretty well. More story-driven than most Lu songs, 'Friday To Sunday' really sprung out of a long fascination I've had with the crucifixion account found in Matthew 27:54 where we see some of the guards at the crucifixion itself declare, "Surely this was the Son of God". I've often wondered the lives of those guards was like from that point on. From there, this song really follows a parallel path of the disciples themselves -- once convinced that Jesus would 'set things straight', and then finding themselves watching him up on a cross. What were those three days -- between the crucifixion and the resurrection -- really like? How hopeless and confused did they feel? What doubts flooded their minds? Finally, though, they find that the 'stone is rolled away' and a new chapter begins." Such a great song, but such a tease. At the time we were all hoping for more Lu, but sadly not the case. They did release a Christmas song a couple years later. And those are sadly the only Lu songs on Bandcamp. This track stands apart and unique from all other Poor Old Lu songs, yet is quintessentially "Lu" in nature. It was written and recorded in an effort to raise money for Paradise:Uganda--one of Jesse's passions--and began simply as a studio jam session with Aaron and Jesse laying down scratch tracks. Nick and Scott ended up in the studio a few months afterward to record their parts, but the lyrics and melody were not born easily. In fact, it took another year before Scott was content with his parts of the song--most of which were recorded in non-studio locations, including a friend's church office and his mom's living room. The female backing vocals from our friend, Jen Hirschman, make this the only POL song with such a feature. The lyrics are perhaps more difficult. There is a sadness to them that reflects some personal crises during that time. Rather than a baptismal-type calling of "join me here, the water is fine", it's written from the outside-in. It asks "why make those choices when the weight is so much to bear?" The reply is summed up at the tail of the chorus: "So breathe in deeply, my son. I swear I've won. This need not be the sum of the one I've called My own." It begs the listener to consider that our failures do not define us, but rather our responses to them. 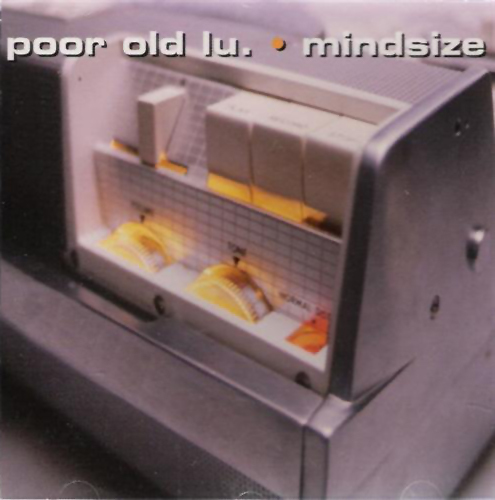 Another one of the last songs written for "Mindsize", it became our first real single (though 'More' was the first official single, it was not promoted as such). Within a few weeks, Cruciality hit #1 on one of the popular Christian charts. During a show in Irvine, CA, our record label presented us with a plaque to commemorate the event. "Definitely not the usual way to start an album, but by this time we were doing things our own way, and not for booming record sales. The song was written as is (long intro and all), but the decision to put it at the beginning of the album came later. We weren't concerned. If anything, 'Rail' has a definite vibe of The Cure, one of our favorite bands growing up (except Jesse). 'Rail' still remains as one of my very favorite songs. This was a difficult song lyrically. I struggled for some time with the chorus. Not writing it, mind you, just accepting that it was "ok" to sing that. At this point, all of us except for Jesse were married. When you get married (or engaged) it often throws you for a loop... and this song shows some of that. The first few lines (Jesus tie these hands...) speak of the wrong decisions that I had made in my previous relationships. Relationships that should never have been. I ended up hurting a lot of people, including myself." This song is what actually led me to discovering Sunny Day Real Estate. Somehow I was not aware of them until after they broke up for the first time. "Always one of our more popular songs. I suppose that is because it features our long-time friend, Jeremy Enigk, who also sings with Sunny Day Real Estate. Aaron, Nick, Jeremy and I played together early on, if you can call it playing! We had fun. Since this song was written to be a duet, we thought it would be great to sing with Jeremy again. And so we did. Jeremy changed the lyrics slightly on the bridge (artistic license, I suppose), but it came out rather well. He also dreamt up the great background vocals!" "As one of the successful singles off of 'Sin', 'Where Were All Of You' may be one of the most representative songs of what Poor Old Lu's sound is like. Aggressive. Dreamy. Deep. Poppy. Something like all of that, but mixed up and jumbled around. This song is especially notable for the driving bass line and very effected vocals. In 1998, a special re-mix was made for the album 'Chrono'." "The thing that sticks out about this song, of course, is the very quiet beginning until it really kicks in. A lot of fun. 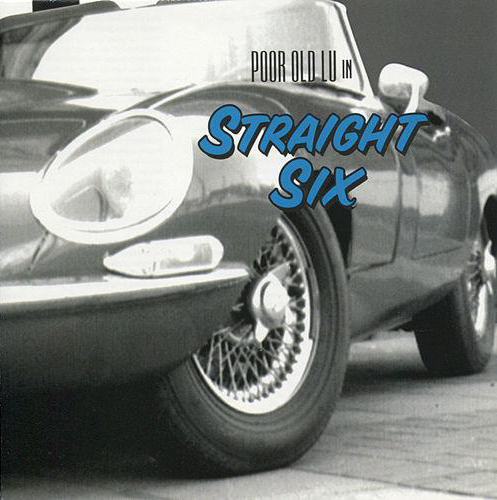 As was the rest of Straight Six, this song was written entirely in the studio as we spent a month writing and recording. The song is boomy, repetitive, strange and catchy. The background vocals on the chorus are strangely memorable, though not recorded particularly well -- somewhat fitting for the whole album, rough and disjointed. In the long run, 'Country' ended up being a good show song." "Arguably the most popular Lu song - at least in concert. 'My World Falls Down' was always a slight notch up in the 'distortion' department than most of our stuff, but still fit very well. The beauty of this song might lie in its aggressive nature that soon tapers off. It is at times sing-songy, but then turns to flat out screams. Come to think of it, this song is strangely complex. I doubt very much that it fits the mold for the perfect pop single, yet it works quite nicely. Some have commented that this song is, perhaps, "perfect". I don't know about that, but it's still a lot of fun to listen to and play. At its very core, 'My World Falls Down' deals with a common struggle of knowing wrong, but doing nothing about it." "As I look back, 'Receive' is one of the most complete and well-rounded songs we had. Unfortunately, we only played a handful of shows after "8th Wonder" was released, so it never became a huge concert hit that it normally would've been. The times that we were able to play it were great. I've also felt that 'Receive' is one the most representational songs for the typical "Lu" sound." 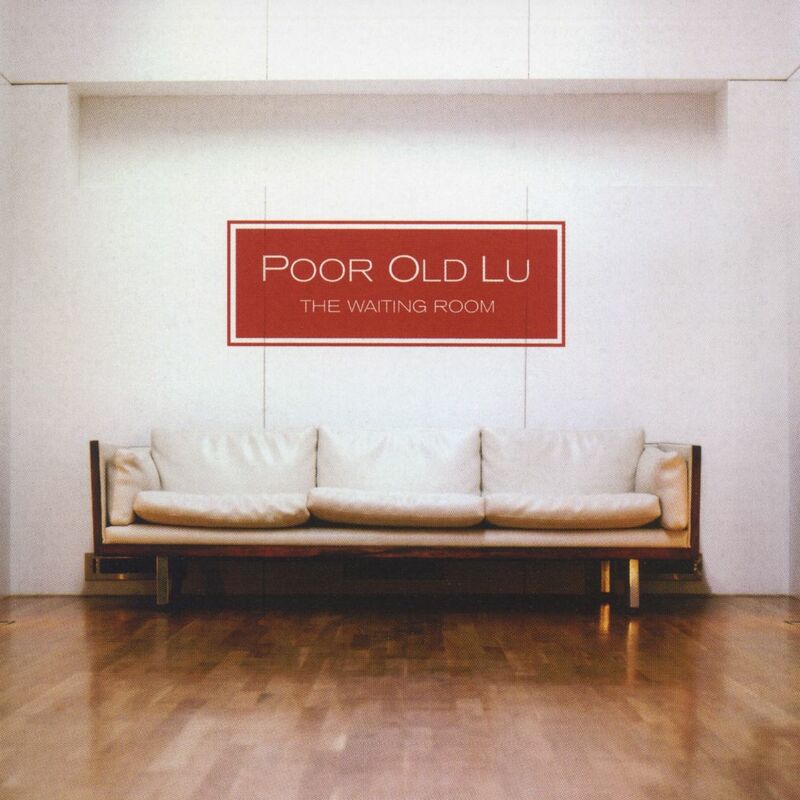 As I began writing this list, I never expected a song from The Waiting Room to be #1, as Sin and A Picture of the Eighth Wonder are by far my favorite Lu albums. But this song has only gotten better with age, and this album no longer seems disconnected from the earlier Lu stuff, as it did at the time. "What can I say about this song? First of all, it is probably in the top 5 of my favorite songs we've written and recorded. I find it haunting and beautifully arranged. In fact, I'm at times shocked that it came out so well. Secondly, we've never had a 'title track' before, but it would be hard to find one more fitting that this. From the slow beginning, to the late, wailing guitars, this song has a wonderful escalation to it, and was a great way to wrap up this album. Some of my favorite parts? I love the rim shots before the first verse, the bass line during the verses, and the double snare hits as you enter the last verse. Also, this bridge is without a doubt one my favorites amongst our collection -- particularly the whispering background vocals. Like the track 'Today', this song pretty much taxed me on my vocal range -- both high and low."